ABBOTTSTOWN, PA, 4/25/2015 – A close call in turn four of lap 21 turned out to be the winning move for J.J. Grasso en route to his second Lincoln career win on Saturday night. Grasso, who led every lap from his outside front row starting spot, was bogged down by side-by-side racing lapped traffic when he felt the heat from 11th-starting Lincoln points leader Brian Montieth. Grasso and Steve Owings actually made contact as Grasso was splitting lapped cars to stay in front. Owings saved it, but dropped to the infield with two laps to go. “This is huge,” said Grasso, “I want to thank my dad. He’s put a lot of money in this, along with BK Trucking and C&B Mushrooms. This is unbelievable. We were quick from the get-go. We were terrible last week, but my dad and the crew worked on it hard, and again tonight in the pits. Grasso’s final margin of victory was 1.53 seconds over Montieth, with Tyler Ross scoring his best-ever finish in third, Cory Haas fourth, and defending track champ Alan Krimes fifth. Rounding out the top ten were Freddie Rahmer, Adam Wilt, 16th-starting Jim Siegel, Kyle Moody, and 20th-starting Austin Hogue. Heats for the 33 410 sprinters were won by Haas, Montieth, Grasso, and Freddie Rahmer, with Brandon Rahmer winning the consolation. 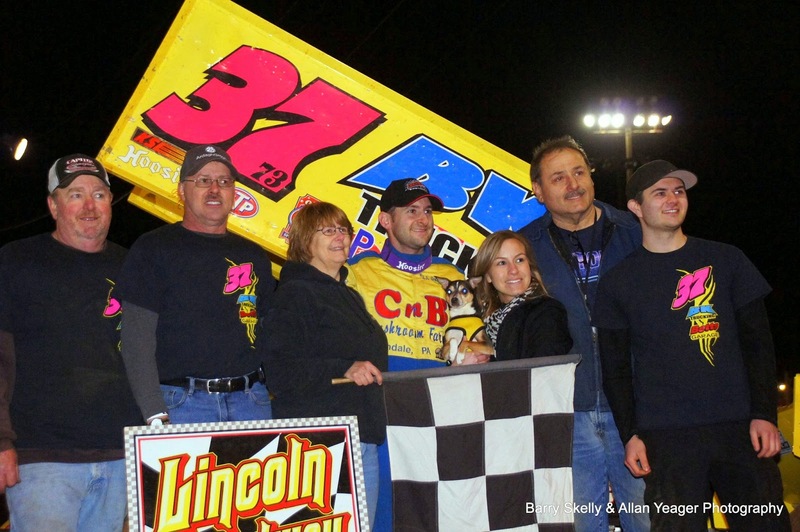 For the second time this season, Adrian Shaffer made a last turn pass to win a 358 sprint car feature. 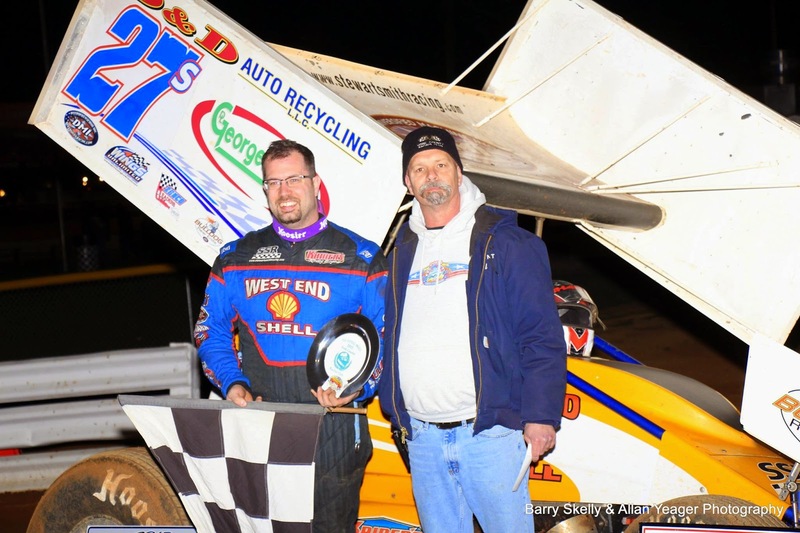 Shaffer gave car owner Stewart Smith a 52nd birthday present by making a perfect last turn slider to get by Chris Arnold and score the win. A disappointed Arnold crossed second, with tenth-starting Chandler Leiby, Doug Hammaker, and Kevin Nouse completing the top five. Sixth through tenth were Matt Campbell, 21st-starting Jeff Rohrbaugh, early race leader John Braim, 19th-starting Todd Rittenhouse, Jr., and Tyler Esh. Heats for the 32 358 Sprinters were won by Esh, Leiby, Nouse, and Doug Hammaker, with Rohrbaugh winning the consolation. Chad Glatfelter started on the outside front row, beat polesitter Harlon Leppo to the stripe to complete lap one, and led every lap of the 15-lap Central PA Legends feature. Leppo spun exiting turn four of the final lap, and was credited with a 17th place finish. Taking advantage of Leppo’s bad luck was opening night winner Bob Stough, who ran third the entire race until Leppo’s final lap misfortune. Third through fifth were Chad Earnst, Bill Diehl, and Mason Chaney. Heats for the 23 Legends were won by Leppo, Chad Glatfelter, and Chaney. Next Saturday night, April 25th, it is the 12TH ANNUAL WELDON STERNER MEMORIAL for 410 Sprints, plus 358 Sprints and All-American Outlaws Time trials get underway for the 410 sprinters at 7:30 PM, with gates opening at 5:30 PM and hot laps getting underway at 7 PM. © Copyright 2010 by Sel-Wil, Inc.
Point Standings for Central PA race tracks.